The circular economy is a policy approach and business strategy that aims to improve resource productivity, promote sustainable consumption and production and reduce environmental impacts. This book examines the relevance of the circular economy in the context of developing countries, something which to date is little understood. This volume highlights examples of circular economy practices in developing country contexts in relation to small and medium enterprises (SMEs), informal sector recycling and national policy approaches. 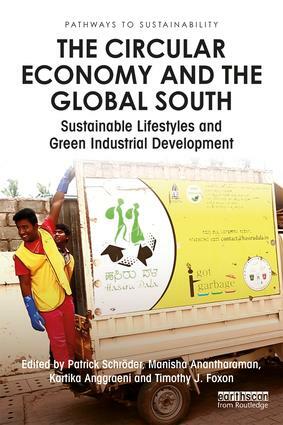 It examines a broad range of case studies, including Argentina, Brazil, China, Colombia, India, Indonesia, Kenya, South Africa, and Thailand, and illustrates how the circular economy can be used as a new lens and possible solution to cross-cutting development issues of pollution and waste, employment, health, urbanisation and green industrialisation. In addition to more technical and policy oriented contributions, the book also critically discusses existing narratives and pathways of the circular economy in the global North and South, and how these differ or possibly even conflict with each other. Finally, the book critically examines under what conditions the circular economy will be able to reduce global inequalities and promote human development in the context of the Sustainable Development Goals. Presenting a unique social sciences perspective on the circular economy discourse, this book is relevant to students and scholars studying sustainability in economics, business studies, environmental politics and development studies.